Scooper - Technology News: What can Lebanon do to address its 'education emergency'? What can Lebanon do to address its 'education emergency'? The education system in Syria is a victim of the country’s conflict; Syrian teachers and students have been displaced, along with their families, and many Syrian refugee children have now been out of school for multiple years. Of the approximately 340,000 Syrians ages 6 to 17 who are registered with the United Nations High Commission for Refugees (UNHCR) in Lebanon, about 45% are in Lebanese public schools, with additional numbers in private, semi-private and non-formal instruction. Lebanon has gone to great lengths to accommodate this tsunami of children. Public schools opened a second-shift in the afternoon to accommodate refugee students in January 2014. The double-shift system has significantly increased access to education services while providing a measure of stability for the hosting Lebanese community. The result of these efforts is striking. 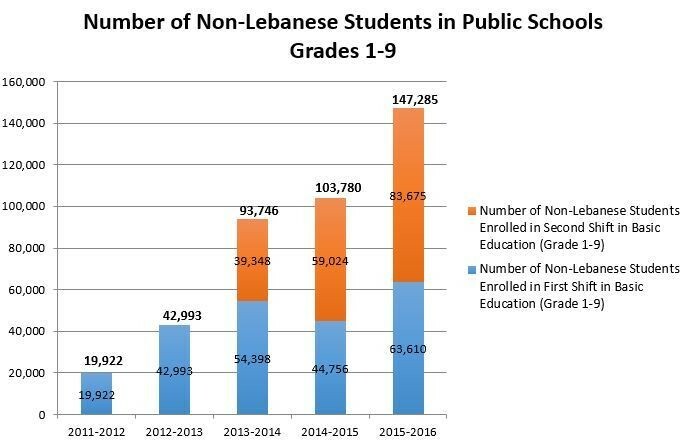 The total number of Syrian students in Lebanese public schools excluding preschool and kindergarten —149,565— represents nearly half of the total number of students in public schools—315,326—according to data collected by UNHCR and Lebanon’s Ministry of Education and Higher Education. An estimated 3,000 Syrian students are also enrolled in technical and vocational education. Despite these efforts, currently available data indicate that about half of the Syrian children living in Lebanon today are working or otherwise not engaged in learning[[/tweetable]]. Much of the progress to date has been in the early years of formal education: most Syrian refugees in school are in grades 1 through 9, while older Syrian refugee children in Lebanon have a much lower probability of accessing education. Less than 10% of Syrian refugees of secondary school age are in classrooms . Based on data and estimates from sources including Lebanese Ministry of Education Lebanon’s Education ministry has created the Reaching All Children with Education strategy, which provides a framework for donors and partners to invest in educating Syrian refugees while at the same time strengthening the public school system of Lebanon and benefiting host communities. The World Bank along with UNICEF, UNHCR, donors such as UK DFID and others have worked together with the Ministry to increase access and are continuing to expand enrollments while also trying to maintain and improve education system quality. With fewer than 1 in 10 Syrian refugees ages 15, 16, or 17 enrolled in secondary school or technical/vocational education, the risk of losing a generation of skilled professionals is very real . It will become very difficult for this generation of Syria’s children to re-enter formal education and go on to become doctors, engineers, or teachers, denying Syria the human capital it will need when the time comes to rebuild. In pre-primary education, where there are large returns to early investment, enrollment rates are also low. Depressed levels of pre-primary and secondary education are also present in the Lebanese population hosting the refugees, particularly the poorest. The World Bank is providing both short-term emergency and medium-term technical and financial support to the Government of Lebanon to address these urgent needs in education. A US$32 million dollar Emergency Education System Stabilization Project uses grant funds to support the operational needs of Lebanese public schools and improve their learning environment. The Research for Results initiative combines education service delivery research with system-wide analysis and a communication and stakeholder engagement plan. And in response to the Syria Conference held in London last February, the World Bank is preparing to scale up its support to the new 2017–21 RACE plan along with other international and national donors and partners.